Paris, Feb.16th – Amendments in the European Parliament to the “Telecoms Package” 1 may allow operators to take control of their customer’s usage of the Net. According to amendments pushed by AT&T, “network management practices” could be used to discriminate what content, services and applications users could access and use. Such “net discrimination” causes great risks to the very structure of Internet, and its innovation and growth models. It is also a massive threat to user’s rights and freedoms. Who would want this for Europe? On Feb 19th will officially begin the second reading of the “Telecoms Package” in the European Parliament. In reality, at the very same moment, a political agreement may be reached after ongoing opaque negotiations between the rapporteurs, the Commission and the Council. Insights from the Parliament reveal that extremely disturbing provisions2 defended by telecom operators, and mainly the US giant AT&T3, might get through. Using the intentionally vague wording of “network management policies”, operators may be authorised to get total control of the network and their users’ activities. ﻿“At this stage of the procedure, what the rapporteur is ready to accept is likely to be voted in plenary. The responsability of promoting, or conversely opposing to, extra-european interests going against internal market and consumer protection, is lying on his shoulders.” explains Gérald Sédrati-Dinet, analyst for La Quadrature du Net. Such a scheme of “net discrimination” would allow operators to prioritise or deprioritise, allow or forbid, access to content and services, as well as usage of applications. On the pretext of addressing network congestions and using the fear of a “collapse of the Internet”4, and in the name of “diversifying their offerings”5 operators want to get the ability to filter their networks content and usage in order to sell more services. You are connected to a cheap Internet access. A friend sends you a link to a page on Wikipedia. You click it to see a message from your operator : “sorry, this website is not accessible in your offer. please upgrade.”. You would not be connected to the same “Internet” as your friend anymore. You are connected through an operator who just merged with Vivendi-Universal. When you try to watch a video from Sony or Warner bros, it is incredibly slow. Only videos from Universal are fluent. Operators could distort competition to favour their own services. A new entrant actor innovates by creating a new protocol or application or service. Users may not be able to use it until their operator agrees. Innovation would be in the hands of operators. You are accused by the music industry of having downloaded music without authorization. Usage of any peer-to-peer software is automatically restricted, or become incredibly slow. ISPs would, under the pressure of the entertainment industries, substitute to the judicial authority. This is not a fantasy, as a recent amendement6 in the US Senate to the “Stimulus Package” proposed to use “network management practices” in order to “prevent copyright infringement”. “Net discrimination” may be exactly what the entertainment industries are waiting for in their idiotic and archaic war against their clients7. “Allowing operators to choose what their users can do with their access would be a major disruption in Internet’s model of growth and its innovation. Such ‘net discrimination’ would lead to access to operator-controlled networks that would not deserve to be called ‘Internet’ anymore, like on the mobile phones where VoIP, filesharing and streaming are filtered. Members of the European Parliament, and especially the rapporteurs, must frame ‘network management policies’ to what is strictly necessary to guarantee the security of the networks and of their users.” concludes Jérémie Zimmermann, co-founder of La Quadrature du Net. More informations, along with a descriptive dossier, will be published soon. 5. 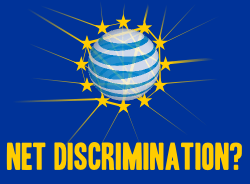 Recital 14b to Universal Service directive, as proposed by AT&T, claims “the right of network and service operators to diversify their offerings in a competitive market, including through the imposition of reasonable usage restrictions“. In a competitive market, new services shall have extra added value, and not be more restrictive! 7. More examples of that absurd war can be found in the Medina Report: http://www.laquadrature.net/en/copyright-dogmatism-ridiculously-strikes-european-parliament, the french “graduated response” law, HADOPI: http://www.laquadrature.net/fr/HADOPI, or other softer forms of the so-called “three strikes and you’re out” policy in Ireland or in UK. This entry was posted in Cyberocracy, EU, EU Commission, EU Parliament, Europe, Information Society and tagged Commission Européenne, Controlemaatschappij, Cybercratie, Cyberocracy, Europe, European Parliament, Europese Commissie, Information Society, Net Descrimination, Netdiscrimination in Europe, Parlement Européen, Politics, Telecom, Uberveillance by Daniel Verhoeven. Bookmark the permalink.